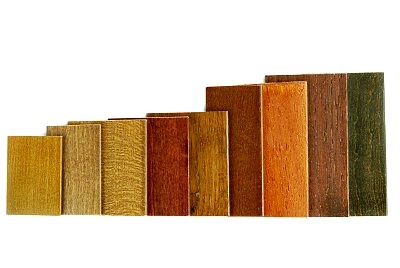 Hardwood flooring planks are created from a wide variety of wood species that each has their unique colorings and physical characteristics. They range in color from light to dark and pink to brown, and each has natural traits that are distinctive to it’s appearances such as knot holes, swirls, and grain patterns. Hardwoods are made from both domestic and exotic tree types, and each species has its own visual and physical characteristics that make it different from the next, including color, grain, texture, and hardness. Depending on where your flooring is going to be installed, the amount of foot traffic it will see on a daily basis, and the overall look you want to achieve, the expert flooring contractors at Sandy Springs Hardwood Flooring will help you decide which is the best species to use for your residential or commercial property. Oak: Rigid and dense, oak has an open grain and gives off a traditional warmth. It comes in a variety of shades of white and red and takes stains very well. Maple: An extremely sturdy and long-lasting wood, maple is known for its shock resistance. It has clean lines and a uniform texture. It comes in colors ranging from off-white to light tan mixed with a little bit of red. Hickory: Hickory is one of the hardest and most durable hardwoods, making it perfect for more active homes. It has a dramatic grain pattern and wide color variation in each board, giving it a rustic appeal. Ash: Ash is similar to oak flooring but has a more subtle and consistent grain pattern. It is very strong and durable and comes in a variety of colors from cream to dark brown. Cherry: This type of hardwood is very smooth in texture and has a fine grain pattern. It comes in a variety of pinks and reds, deepening over time and with light exposure. Walnut: Slightly softer and lighter than the other hardwood types, walnut is known for its distinctive grain patterns and swirls and knots. It has a rich, dark brown color that stands out in any home. ﻿﻿﻿ With our wide assortment of wood species, Sandy Springs Hardwood Flooring can help you custom design a new floor for your home. Whether you want a traditional look, a rustic look, or a modern and contemporary look, we can achieve them all using the proper wood species and finishing products. Just tell us where your floors will be installed, how active your family usually is, the overall vibe of your home, and if you have any pets, which will help us narrow down your material types into a less intimidating amount of samples to go through. Let’s get started planning your new beautiful and long lasting hardwood flooring! Give us a call at Sandy Springs Hardwood Flooring at (404) 341-7071 .